A major component of the Wellness Home is healthy nutrition. Eating a balanced diet is vital for good health and wellbeing. Food provides our bodies with the energy, protein, essential fats, vitamins and minerals to live, grow and function properly. We need a wide variety of different foods to provide the right amounts of nutrients for good health. There are six basic nutrients required for good health. Carbohydrates-Carbohydrates are grouped into two categories: simple and complex. Carbohydrates are the main energy source for the brain. Without carbohydrates, the body could not function properly. Sources include fruits, breads and grains and starchy vegetables. Protein-which is broken down into amino acids by the digestive system. Protein is the major structural component of cells and is responsible for the building and repair of body tissues. Lean protein sources such as low-fat meat, dairy, beans or eggs. There are many other vegetable sources of protein, if that is your personal choice. Fat-The fat in food includes a mixture of saturated and unsaturated fats. Fat is an energy source that when consumed, increases the absorption of fat-soluble vitamins including vitamins A, D, E and K. Choose healthy options such as omega-3-rich foods like fish, walnuts and vegetable-based oils. Omega-3s help with development and growth. Limit intake of saturated fats such as high-fat meats and full-fat dairy. Other smart choices include nuts, seeds and avocado. The best way to get these vitamins is to eat a healthy and balanced diet with plenty of fruits and vegetables. A multivitamin may also be useful to help fill in the gaps if you have a restrictive diet. Minerals- These essential nutrients, those that your body needs but cannot produce, include the inorganic substances found in foods such as: calcium, potassium, sodium, iron, magnesium, phosphorus, chloride and Trace Minerals. Water- said to be our most essential nutrient, read more in Down the Hatch. Water helps to maintain homeostasis in the body and transports nutrients to cells. Water also assists in removing waste products from the body. We recommend drinking half your body weight in ounces per day. Whenever possible choose fresh organic produce. We strive to eat as natural as possible and avoid processed foods. Many processed foods, including canned and frozen vegetables contain added sugar. In our Wellness Home we make a conscious effort to keep our sugar consumption at a healthy level, 36 grams or 9 teaspoons a day for me and 25 grams or 6 teaspoons a day for the ladies in the house. Unfortunately, our busy fast-paced lives often impede with our choices for healthy eating. I’m sure we have all experienced the trials and tribulations in shopping, food preparation and all that goes in to preparing and consuming healthy meals. One way to counter act this is supplementing our food. Many supplements fall short in what they deliver in terms of natural provided nutrients. Nikken’s philosophy (and ours) is that the best way to take care of our nutritional needs, is the natural way. Nikken created the first complete program based on natural, organic ingredients. These fill the nutritional gaps in our daily diet, to help us "eat right," even when our meals may fall short of their nutrtional mark. Organic-Based Nutrition means that all ingredients are carefully chosen, and the organic content is maximized. 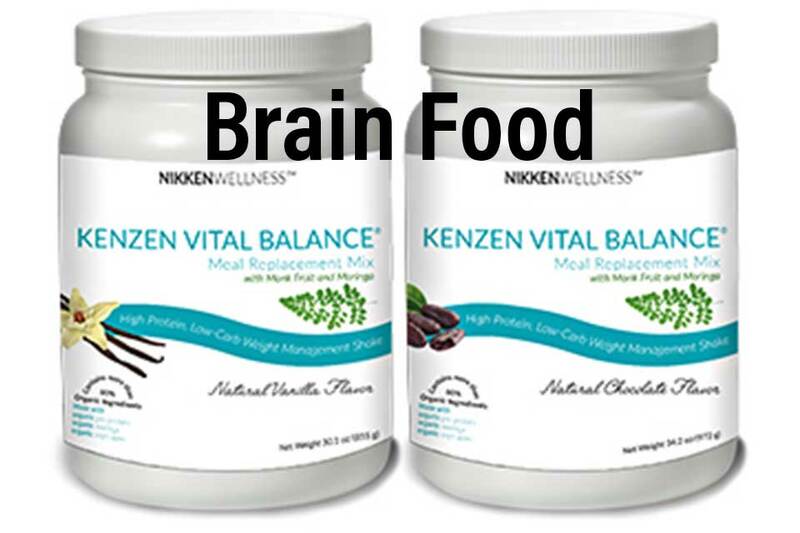 Nikken Kenzen® Wellness nutrition is founded on a whole-food philosophy. These organic-based solutions help bring our daily diet closer to nature and is an integral part of our Wellness Home. Kenzen Vital Balance® Meal Replacement Mix- We kick-start every day with a KVB shake. KVB’s formula contains organic moringa and naturally sweet monk fruit in addition to organic pea protein and organic vegetables. It is designed to help burn fat and boost metabolism as well as promote healthy brain function and the elimination of toxins in the body. With pre- and probiotics to assist in digestive and immune system activity, the Kenzen Vital Balance formula is food for action and food for thought—for people of all ages. Naturally-sourced protein from organic pea, organic rice and organic chlorella to promote the formation of lean muscle mass without the high levels of saturated fat and calories associated with animal protein. Jade GreenZymes®- We have glass of JGZ’s twice a day. Made with organic barley grass and our Proprietary Blend of organic acacia and organic pearl barley seed extract powder. Kosher and vegan certified and USDA Organic. Kenzen Super Ciaga® - We use this once a day and have developed some very delicious drink variations. An organic mixed superfruit juice concentrate made exclusively with organic fruit content. This advanced formula is made with a select group of superfruits chosen for their nutrient and antioxidant characteristics. Highly concentrated, it has an exceptional ORAC value. • Great replacement for sodas that may contain artificial sweeteners or lots of sugar. Simply mix with Nikken PiMag® water or seltzer for a naturally sweet beverage. Super Ciaga bottles are made of an environmentally-friendly polymer that contains no bisphenol-A (BPA) or other potentially harmful chemicals, are easily recycled and compared to glass, require fewer resources to store and transport. An effective nutritional strategy is more than just what we eat. It requires attention to many self care processes that can affect our well-being. Quality sleep, proper hydration with healthy water, reduction of our body burden of toxic chemicals and stress management are all important for improving and maintaining good health. One of the most important decisions we make every day is what we eat and drink. It is everyone’s Choice to eat Healthy or not.